The Mumbai-Ahmedabad bullet train project moved a step closer to reality, after the National Board for Wildlife (NBWL) cleared construction work in and around wildlife zones in the Mumbai Metropolitan Region (MMR), but only after the builders create safe passages across the railway line for wild animals. The wildlife board is one of several agencies that need to approve the construction work. The 52nd meeting of the board, chaired by Union environment minister Dr Harsh Vardhan, decided the state government would give permission to start work only after the National High Speed Rail Corporation Limited (NHSRCL), which is building the railway line, submits a detailed animal passage plan based on guidelines by the Wildlife Institute of India (WII), Dehradun. The board said two wildlife corridors will have to be built for animals such as leopards, wild boar, chital and sambar deer. These animals are known to use the area the project would occupy to cross into different forest areas. The first corridor will be an overpass over the existing Diva -Vasai railway line, and the proposed rail line for the bullet train. Space for the second corridor will be made by elevating the existing 1.5-km Chinchoti Anjur Phata road, which falls under the public works department, by at least 6 metres. This would make enough space to build an underpass for animals. 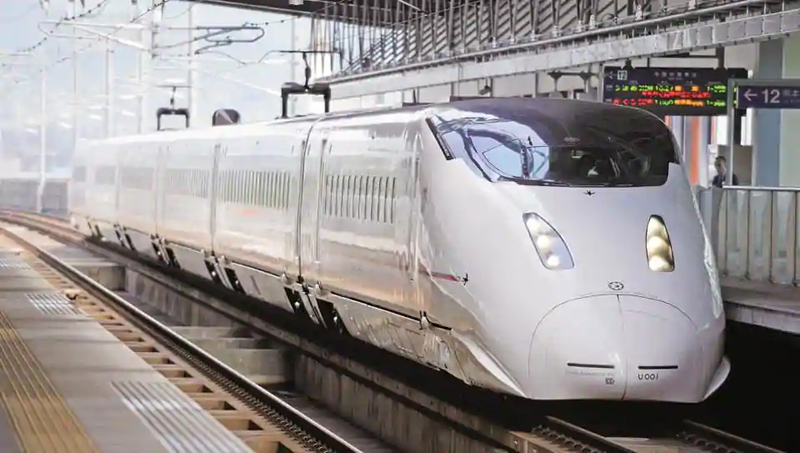 The bullet train project needs 115.5 hectare forests — roughly 78 Wankhede Stadiums — from notified eco-sensitive zones of the Sanjay Gandhi National Park (SGNP), the Tungareshwar Wildlife Sanctuary and the Thane Creek Flamingo Sanctuary. Other measures to mitigate the project’s impact on wildlife include noise barriers, fencing to prevent animals from straying on to tracks and removing construction debris from forests. State officials who presented the proposal at the NBWL meeting said the existing culverts and underpasses on the Chinchoti Anjur Phata road, near Nagale, could be widened to allow easy wildlife movement. “While discussing the mitigation measures, all agencies, from the project proponents to the wildlife institutes, under the leadership of additional chief secretary Praveen Pardeshi, were present and unanimously agreed to the suggested methods,” said MK Rao, additional principal chief conservator of forest (west), forest department. Rao, who was an invitee to the NBWL meet, added that few states had gone into as much detail to protect wildlife for any project. The wildlife board has also asked for the formation of a joint wildlife corridor expert team, comprising SGNP and TWLS wildlife departments, the Bombay Natural History Society, WII, Satpuda Foundation, and the Wildlife Conservation Trust (WCT) that will design and implement the creation of an effective wildlife corridors. “NHSRCL and the joint team will monitor the progress and status of the project construction as well as the wildlife corridor development on a monthly basis and report to the state government and state wildlife board (SBWL),” said an official from the Union environment ministry. “We will comply with all conditions and guidelines imposed by NBWL and the Maharashtra government as already discussed with both bodies,” said a spokesperson from NHSRCL. The SBWL headed by chief minister Devendra Fadnavis had on December 5 put clearances to the bullet train project on hold to study the impact on wildlife habitats. Fadnavis set up a committee under the additional chief secretary Praveen Pardeshi to frame measures to mitigate possible impacts on wildlife. “Conservation and development can be balanced only if mitigation measures are considered. Maharashtra needs to fast-track the execution of these underpasses and overpasses for a project of this magnitude by carefully calculating the wildlife population in this zone,” said VB Mathur, director, Wildlife Institute of India Dehradun and member, NBWL.